The Musicarta Patreon Chords webpage is your portal to all things chordal. Every modern keyboard player should be able to find and play chords as easily as a guitarist, and be capable of supporting a melody with the right inversions and playing an accompaniment from chord symbols. This Musicarta Patreon chords page acts as an index to your exclusive chords material. Browse the right-hand navigation or use the links in the index text below to start finding out how Musicarta can help you find and play chords the chords you need. 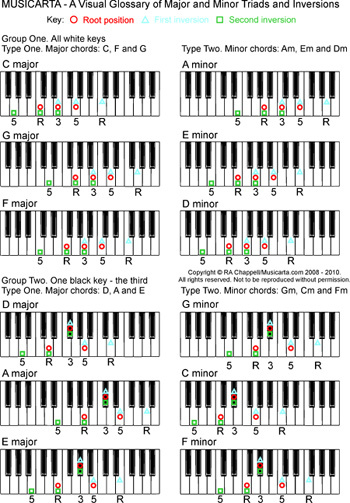 The Musicarta Keyboard Chord Generator is a two-page visual chord dictionary which groups the 24 major and minor triads according to how they look in terms of the black and white keys used. This new approach helps fast-track you to ‘seeing’ the chords you need right there in the keyboard. Click through to the Musicarta Keyboard Chord Generator page for an explanation and ways of getting the most out of this great tool - plus your Patreon Premium download link. Click through here to the Major and Minor Chords module. Click through to the first module in the Patreon Musicarta Inversions mini-series and discover the most efficient way to work towards lightning-fast triad mastery. Keys do feel different under the fingers, and you get to know them. With enough work, you will hear the notes before you play them – the foundation of all playing by ear. Click through here to access your Patreon Premium Triad Shapes Drill page. 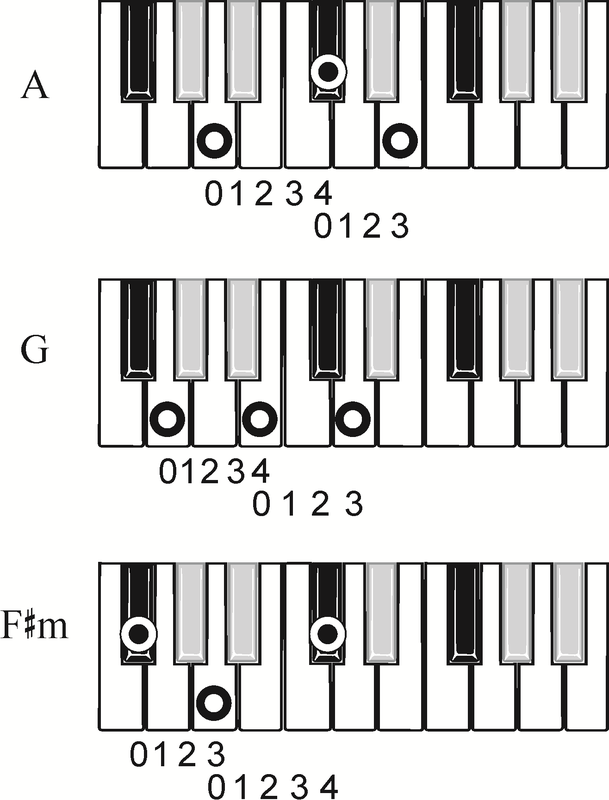 Click through to the Seventh Chords page and make a start on those seventh chords right away. Time spent practising broken chords is never wasted. Traditional piano lessons usually cover broken chord patterns but only as an exam requirement, and without really exploring how close broken chord pattern are to 'real music'. Don't panic! Click through to the Patreon Premium Broken Chords page for a much gentler introduction and some basic broken chord practice patterns to get started with. Accompaniment patterns can easily be made from the root, the third and the fifth of the chord, but they have to practised until they’re ‘practically automatic’ and carry on coming regardless of what the right hand is playing. Because the Roman numeral system designates ‘the chords in any key’, it is central to the business of transposing (changing the key of a piece of music to raise or lower its pitch). You will find Musicarta’s description of the Roman numeral system of naming chords in Part One of the Musicarta Canon Project ‘Transposing’ mini-series. To help familiarise you with the Roman numeral system (RNS), the Musicarta Chord Progressions series is written using both RNS and conventional chord symbols. Link through for a look at the series here. This Musicarta Patreon page is your Chords directory web page. Visit regularly to keep up with the latest additions, and keep an eye on your Patreon messaging app for notifications about new posts.